We know that there is so much attached to working with paper files such as duplicate files or misplaced files. The time wasted finding these files or finding the most up to date version can take up to 20% of your time. On top of this, there is the cost of supporting these paper heavy tasks. 2014 saw Secretary for Health, Jeremy Hunt, challenge the NHS to go paperless by 2018. However, progress for this hasn’t been as fast paced as the government has expected. 2017 is in full swing and the Five Year Forward View and 2020 Framework deadlines are looming. The burden on the NHS to adopt an EPR and reduce financial costs in such a short amount of time places enormous pressure on those working within the system. We want to help you deliver efficiencies to your work so we’re giving you our top tips to go ‘Paper Lite’, easing the pressure and costs, to allow you to take the first steps towards paperless. 1. Bring your files online – Applications such as Microsoft SharePoint can save time, space and money by managing and storing all of your documents. You will be able to access your files anywhere, anytime. 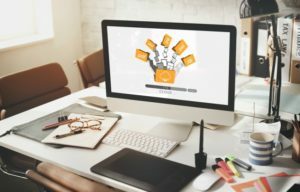 Bringing your files online literally lightens the paper load so you don’t have to worry about physically carrying sensitive data, instead they’re readily available with the tap of the screen from your laptop, tablet, or mobile phone. 3. 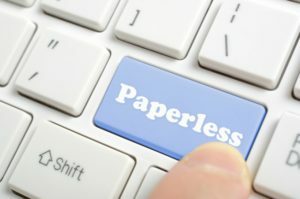 If possible stop the practice of physical signing printed documents, particularly internal ones – eSignatures reduce costs by eliminating the paper, reduce the need for physically storing signed documents because they’re online and allow you to have an accurate and secure representation of who signed a document and when. It’s fully traceable. 4. Sign up for an online fax provider that will email an incoming fax direct to your inbox – Some people say faxing is dead, and while it might not be the newest form of communication, faxing is still very much a part of working life. In 2013 over 16 billion faxes were sent worldwide. So instead of ditching the process, digitize it. By signing up to an online fax provider, you can still keep this form of communication alive, minus the paper. And you don’t have to worry about the extra costs that come with faxing such as the cost of paper, ink cartridges or the machine maintenance. 5. Reduce, Reuse Recycle – Becoming Paper Lite is not just about reducing costs and increasing efficiencies at work; it is also about changing our ways to become more environmentally friendly. Those 16 billion faxes sent out in 2013 were the equivalent of 2 million trees. By moving to more electronic and smarter ways of working, we will have the tools we need to work in more environmentally friendly ways. 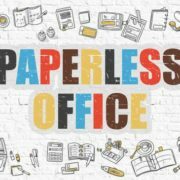 Hopefully these tips will inspire you to pave the way to paperless working in your organisation! CareWorks provides solutions to organisations that serve, engage, and enable patients and people in need. Our software solutions offer care professionals a flexible and modular solution that is built to suit the needs of their organisation. Our CareDirector solution is integrated and mobile allowing health and social care professionals spend more time with their patients and clients and less time on admin, to deliver better care.